New Zealand MP Michael Wood, Under Secretary to the Minister of Ethnic Communities addressed the audience at this year’s Yom Hashoah commemoration event. Speaking at the Auckland Hebrew Congregation, Michael Wood acknowledged the organisers of the events commemorations: the Zionist Federation of New Zealand and members of the Diplomatic Core. Past and present Synagogue Presidents, Rabbis and Community leaders and members were also present, as were survivors of the Holocaust and their descendants. The event was to preserve remembrance and recall the evil of the Shoah, however powerfully acknowledge and remember the courage and humanity of those who suffered and were murdered, along with those who bravely and heroically resisted. Mr Wood says of the commemoration: “I think, it is about remembering and acknowledging the collective bravery and will of the Jewish people to see light from even the darkest of places”. 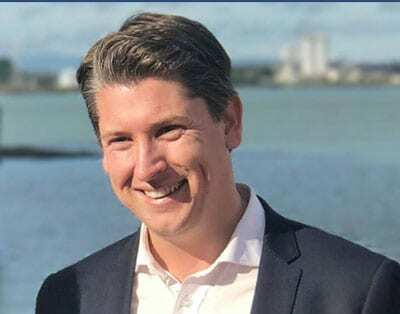 “On behalf of the Minister, I affirm the government’s commitment to working with you to build an open and tolerant New Zealand and to fighting against racism, anti-Semitism, and Holocaust denial whenever they may rear” affirmed Mr Wood. More recently, the efforts of the Auckland Holocaust memorial Trust in keeping alive the memory of those people in the “Garden of Humanity” project was given the MP’s full support. The project is to be viewed as a site of remembrance, utilising a gift of cobblestones taken from the Warsaw ghetto during the uprising of 1943. Auckland-based Holocaust survivor Robert Narev recently met with the MP and offered his full backing for the project that will be important not only for the Jewish community, but many others in our diverse society. Prime Minister Jacinda Ardern and the Minister for Ethnic Communities the Jenny Salesa were absent but sent their greetings and best wishes.